I thought I would get an early start to Hannukah this year, but like everything else, it came too quickly. Of course, I had to come down with a nasty cold right in time for our first of two December holidays! Where did the year go? 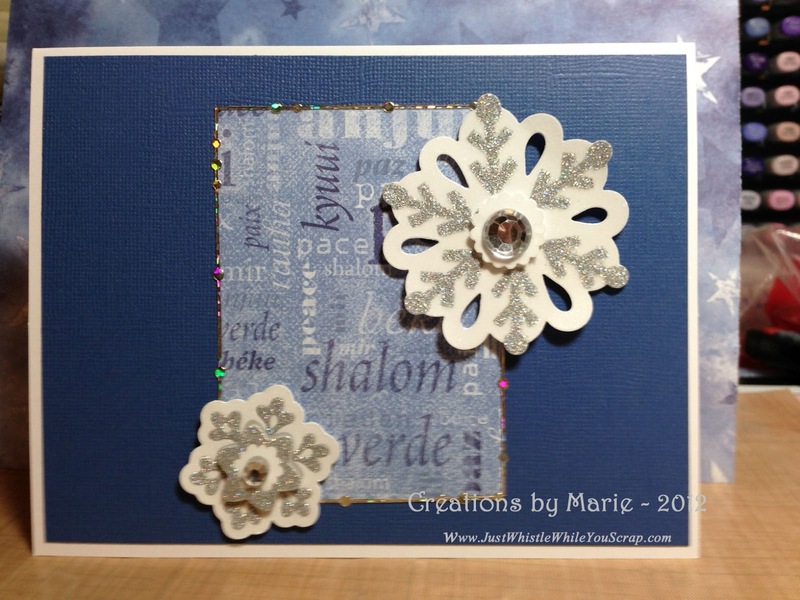 So, all afternoon I spent quality time in my craft room making a few Hannukah cards. I had to make about 7-8 and I had to make them fast, so I gave myself about 10 minutes per card. I have entered my first card in the Tuesday Throwdown this week. 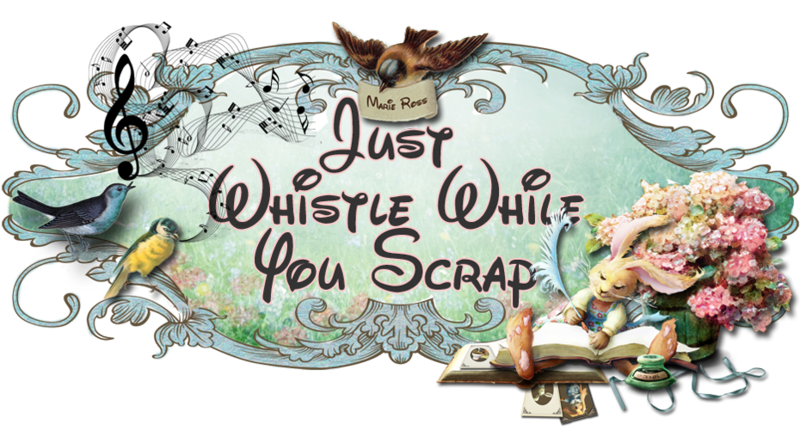 Please go and check out their blog with the link I have provided. Lots of great challenges and beautiful work on display! I had my blue card base already cut out, so I took some paper I had in my stash from a few years ago and trimmed it about 2 inches wide and taped it to the middle of my blue cardstock (Coredinations). I love working with Elizabeth Craft Designs Peel Offs, so I used that to cover the edges of the paper; the embellishements I bought at Michael's and are from EK Success. Both the top and middle card were made about the same, but with different papers and peel offs. 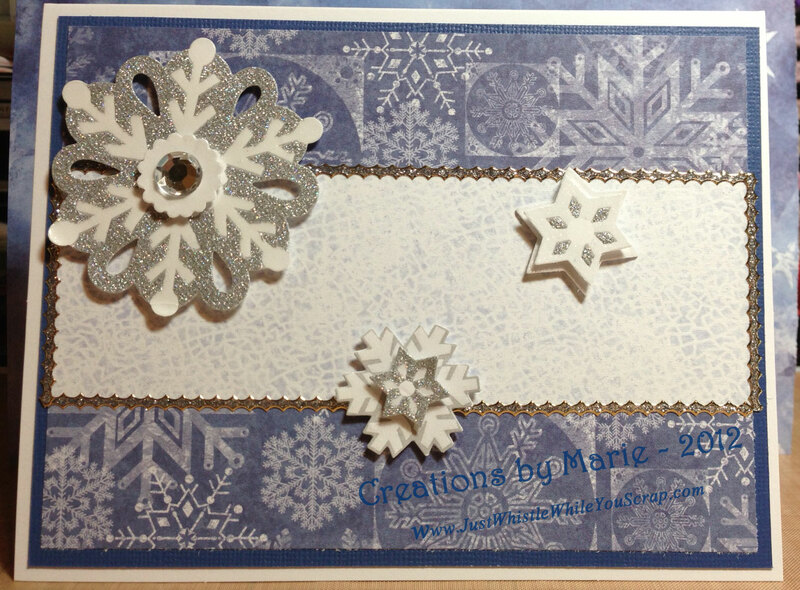 The card presented below was made with the scrap of paper used on my first card above. I then used the peel offs around the entire scrap and mounted it centered on the cardstock. 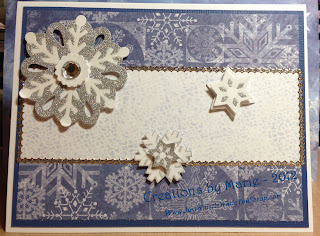 The same snowflakes were used (all from the same package too!). I hope these cards have given you ideas for your own holiday cards. They do not have to be complicated or hard. You do not have to buy new items for your cards. See what you have, draw your sketch and give yourself an allotment of time to finish your cards. Our household celebrates both Hannukah and Christmas...it's nice when they are spaced out because I can give both holidays equal amount of time! Pretty cards! I love the papers you used.